See more information and photos of alekstan. Please advise is Toyota KDH or Nissan Caravan or Toyota HiAce is big enough van for a group of 8 people to travel for 14 days? Please have in mind there will be some luggage too. Just I never seen such models live, so can’t imagine are those big enough. I think you will need the KDH 220 which is a 14 seater. The standard KDH 200 is an 8 seater which will not be large enough because it includes the driver and there will be nowhere for luggage. Confirm how many seats there are for passengers. You really do not want the exact number of seats as it will not be very comfortable. I have an offer for KDH 221 2016 year model. The driver tells it’s 8 seater. Will it be enough for everyone and luggage too? Is it the same as HiAce model? Is the driver saying there are 8 seats in total or 8 passenger seats? I would ask to see photos of the inside, then you can decide for sure. As far as I know the model is Toyota Hiace and KDH refers to the engine. 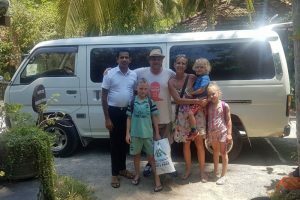 Is Toyota Caravan OK for a trip? I mean is it not too big to travel through the mountains, because we’ll go to Ella then to Kandy? Do you mean Nissan Caravan? Again, I think there are many different types. You would need to confirm how many passenger seats it has. There are no limits on the mountain roads. 50-seater buses use these roads everyday with no problems. However, if you choose an accommodation located on a small track then there may be some access problems. I have now given the drivers permission to send you photos. You can request this from them. See more information and photos of N2 Travels. We have a 14 seated Toyota Grand Cabin Van. Normally we does not use last raw seats and it will be removed for baggage space. Then it has 10 seating facility. Toyota coaster bus or Toyota Grand Cabin van suit for 8 people. See more information and photos of manishanine. Hi John, i am trying to find out whcih type of car will be suitable for 4 people to fit comfortably ? plus luggage . It really depends on the size of the people and the luggage. In any case a car would be ok for a single journey. If you are planning a tour over multiple days then I would go for a van. It is worth the extra few dollars to have the space to relax. It is not comfortable to sit in the centre seat in the rear of a car and you will not have much of a view.